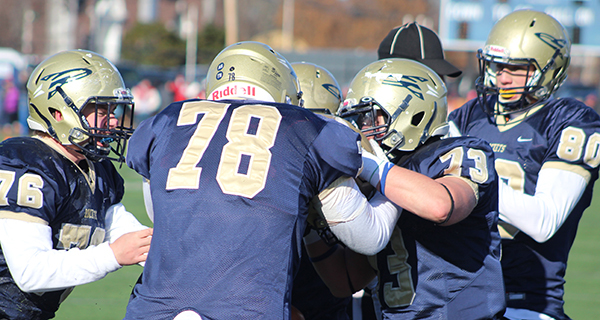 Needham defensive back Max Sylvia (7) chest bumps a teammate after a big fourth down stop late in the first half. Jacob Schneider (78), Timothy Hagerott (76), Matt Smith (80), and Will Baker (73) both Tyler Reid following his second quarter touchdown. 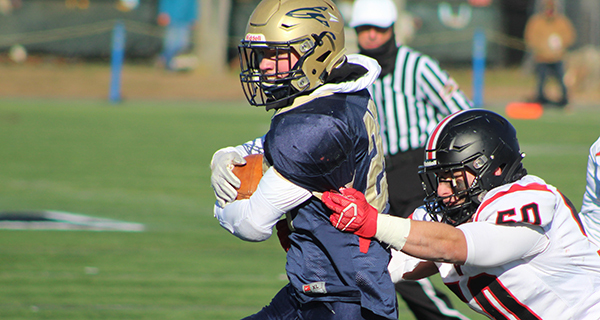 The 131st edition of the oldest high school football rivalry in the nation came right down to the wire on Thursday, as Needham held off Wellesley 14-13 for a thrilling Thanksgiving Day win to finish the season at 7-3. Wellesley’s defense forced a turnover on downs on Needham’s game-opening possession. The teams then exchanged a pair of fumbles near midfield, keeping the game scoreless after one quarter. A six-yard touchdown run by Tyler Reid midway through the second quarter allowed Needham to enter halftime with a 7-0 lead. Shiloh White dashed 69 yards to the end zone to tie the game at seven on the first possession of the second half for Wellesley. Duke-committed tight end Matt Smith has made a lot of big plays throughout his four years at Needham, but none were bigger than his 76-yard touchdown return down the far sideline on the ensuing kickoff to put Needham back ahead at 14-7 with 10:26 to play in the third quarter. With 5:01 remaining in the contest and Wellesley needing a score, senior quarterback Malik Sinclair found senior wide-out Hugh Callahan in the back-right corner of the end zone for a 19-yard touchdown strike to pull Wellesley within one at 14-13. The Raiders (5-5) opted to go for two with a read-option, but Shiloh White was stuffed at the one by Jack Hayes, allowing Needham to preserve the one-point lead. Wellesley’s Trevor Foreman (50) attempts to wrap up Needham’s Tyler Reid (25) during this year’s Thanksgiving tilt. Needham chewed up some clock with Tyler Reid power-runs and forced Wellesley to burn their timeouts. The Raiders got the ball back with a little over a minute to play before Marc Cifiello sealed the 14-13 Turkey Day victory for the Rockets with an interception on fourth down.